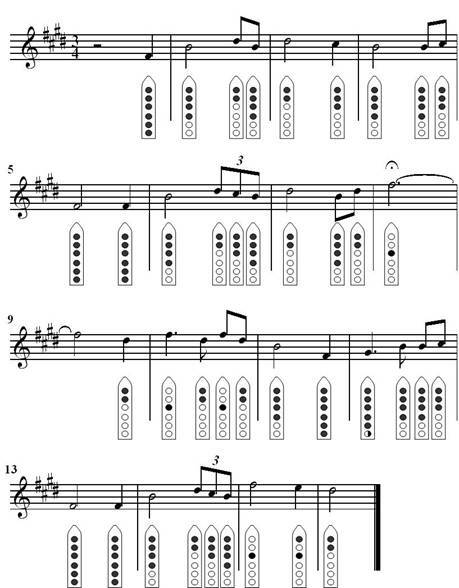 Nakai Tablature has become the standard method for writing music for the Native American flute. This system was first written about in Art of the Native American Flute, by R. Carlos Nakai and James DeMars, Canyon Record Productions, 1996. 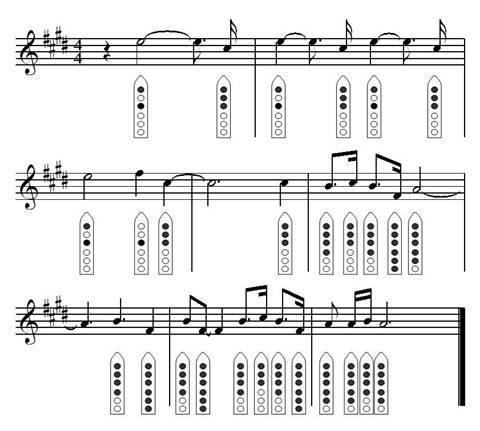 This system uses notes on a musical staff to represent finger positions on a flute. By doing this, other musical information such as rhythm and dynamics can be represented. The chart below is a depiction of every note that is possible to play on the Native American flute. Every flute is different and it should be noted that there some notes particularly the highest ones, can be played in different ways. Below are some sample songs. Visit www.flutemusicfromtheheart.com for more CDs, Song Books, Sheet Music and Instructional Packets. For additional sheet music, check out the Oregon Flute Store sheet music selection.